Ryan Capretta (MS, CSCS) is the Executive Director of Proactive Sports Performance, LLC. As Executive Director, Ryan is responsible for the philosophy, culture, facility, program design, and overall continued success of Proactive. Ryan is a strength and conditioning coach with over seven years experience at the professional and collegiate levels, including stints with Stanford University and the Baltimore Ravens during their Super Bowl Championship season. Ryan has trained Olympic Gold Medal winners and athletes in the National Football League, Major League Baseball, National Basketball Association, and Wimbledon. While Ryan was with the Ravens, the team established several NFL records en route to a 34-7 win over the New York Giants in Super Bowl XXXV. Ryan then accepted a position at Stanford to work with Tyrone Willingham, where his duties extended from year-round strength, conditioning and speed training for all major sports to responsibilities as an offensive assistant for the football team. While at Stanford, Ryan trained numerous NCAA championship teams and Olympians in various sports. Ryan was also appointed Stanford’s Interim Head Strength and Conditioning Coach for football, where he organized Pro Combine testing day on campus. At Stanford, Ryan worked extensively with the sports medicine department’s rehabilitative programs and also played an integral role in designing and implementing a plan for Stanford’s new multi-million dollar training facility. He moved on to the professional level again working as a strength and conditioning coach for the Arizona Cardinals. Under the Cardinals he was able to work with Kurt Warner, Emmitt Smith and Larry FItzgerald, where he stayed for three years. In 2005, Ryan returned to his hometown and opened Proactive Sports Performance, a unique and personalized training company. In a short time the diverse programs at Proactive Sports Performance have been featured on a variety of media outlets including ESPN, The Jim Rome Show, KABC 7, KTLA 5, Yahoo Sports, Fox Sports and many others. Ryan has also served as a contributing strength specialist to Men’s Health and Muscle & Fitness Magazines. 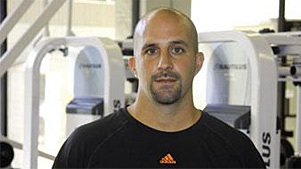 Capretta is also the strength and conditioning coach for the Pepperdine University men’s and women’s basketball teams. Clients of Proactive Sports Performance include Super Bowl champion and former charger Clay Matthews Jr, Pro Bowlers Antonio Cromartie, Terrell Suggs, Keith Bulluck and Dwight Freeney. Other NFL clients are Jimmy Clausen, C.J. Spiller, Taylor Mays, Andre Carter, Donald Brown, Eric King, Casey Matthews, Calais Campbell, Brian Cushing, Arrelious Benn, Jamaal Anderson, Dashon Goldson and Edgar Jones to name a few.